A horror movie role-playing game. The sun’s setting and you’re on your way to the camp site. You had tents, booze and a flimsy excuse about school work up on that old Indian burial site. No one cared about the work, or the warnings from the old man at the gas station, instead you pitched the tents, started playing loud music and drinking. Dead of Night is a game which touts itself as a ‘campfire roleplaying game’. It is played with minimal rules and only two dice, passed around like a talking stick. The first edition was small enough to fit in a pocket and charmingly ugly. The second has more finesse, a little less about the portability, but far better than the original. Dead of Night is meant for single role-playing sessions. 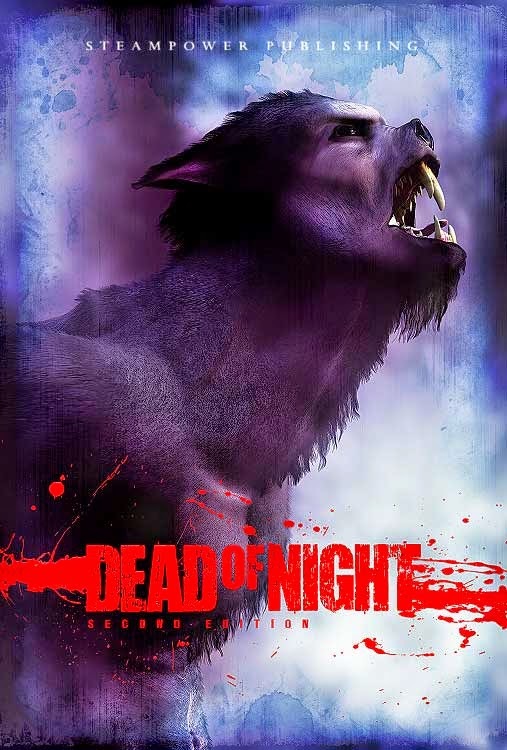 There’s nothing saying it can’t be a series, but Dead of Night is the kind of game which highlights the the moment a player’s character is at risk of death or bring turned into a monster. The system replicates the drama of a horror movie, and that’s its intent. He is cut off as shadow beasts charge through the groom’s side of the church, ripping them to pieces. The bride faints. The groom runs away, only to be torn apart by one of the beasts who are now entering from behind the altar. The book contains several plot hooks in the style of any horror movie you’ve seen in the past or present. It could be a Friday the 13th style slasher flick, a strange body horror movie, a zombie invasion or a modern Saw-type movie. The book lists examples and gives example stories for each genre, sometimes with convincing movie posters for them. In the core book are four full adventures but Steampower Publishing site has made a few more including hooks on the back of fake movie poster postcards and the tools for building your own game are immense. Once the storyteller has picked or created their own game, the players make characters. This is a quick process, so that you can make characters on the night and replace any dead characters pretty easily. Each character has eight stats, each paired off (Identify/Obscure, Persuade/Dissuade, Escape/Pursue, Assault/Protect) and each pair totalling ten points. That means if you’re good at attacking you’re bad at defending. There are ways to mitigate this, including sacrificing points from both to gain an even higher-rated speciality. For instance you could have Identify 6 & Obscure 4, but if you wanted some flavour to your character an an identifiable skill you could change that to: Identify 5, Obscure 3, Expert Tracker 7. Whatever stats you have, you roll 2d10 and aim high. Normally a 15 will get you the result, but the storyteller might make things easier or harder for you depending on the roll. And don’t roll a 13. Whatever you do, don’t roll a 13. There’s only one pair of dice to use, and once you’ve rolled them, you’re not allowed to roll again until someone else has. This way people can’t dominate the scenes and everyone gets a turn. This helps keep the pace and makes scenes really frantic when players are alone and can’t act again until someone else has narrated something and rolled a dice. The ‘campfire game’ mentality really speaks to this, creating a kind of ‘talking stick’ of the dice. Since the zombies had eaten everyone else in Parliament, James had kept calling himself Prime Minister. His driver, Doug, bore the brunt of most of his bad behaviour. James wanted to keep the journalists on his side, after all. Once the bunker doors opened, they had seen the wreckage London had been left in. Doug sighed and started the walk down to the car park. The limo was still there, in the distance. The only car untouched, probably because it was such a bad choice of escape vehicle. He still didn’t believe this whole ‘zombie’ thing. It was probably just immigrants, like the tabloids always said. Or loony left-wingers. Or hoodies. The car park’s lights flickered. Broken, like everything else in this country, he thought. As he got closer, he saw a shadow, then another. There were people down here. Other survivors, possibly? The shadows stopped, and he heard the noises of footsteps shuffling towards him. I’ve mentioned previously about my love of elegant mechanics in games, how I like it when they reflect the behaviours of the medium they’re representing. In Dead of Night the main currency is Survival Points. You start with five, and they go down the more you’re attacked. If you see something man was not meant to see, if you’re slashed by a werewolf claw, then you lose a survival point. If you’re out of them, then you’re out of the game. You can earn Survival Points back, though. If you act out a horror trope, you earn a Survival Point. Call out to the zombies, alerting them. Drop the weapon and run after you successfully hit a monster. Say the words, “It’s just the cat” or “I’ll be right back.” Each of these could earn you some Survival Points. The game is essentially a balancing act between acting like all those awful horror movie character tropes and surviving being in an awful horror movie. Survival Points aren’t just health either. They can add dice to your roll, they can even allow you to switch your paired stats for a moment. That way the nerd who’s good at defending himself but not attacking might rage out and start laying into the axe murderer long enough for the cheerleaders to escape. You can also use Survival Points to find an essential item in the nick of time. It’s costly, as that’s potentially your character’s life you’re gambling, but it might be worth it. In a game against werewolves, one player was a former dance superstar who had become a drama teacher. He was on one Survival Point as the werewolf closed in on him and decided to use his final piece of health to have his treasured pair of silver tap shoes in his bag. He plunged one into the face of the werewolf, sacrificing himself for the greater good. They had secured the press room. The snow was thicker than they had ever seen before, and somewhere out there were the creatures. They were scientists once, but no more. Each one killed by the cold and raised into those things. Dead of Night is a really simple system, and the Survival Point currency is elegant in its portrayal of the behaviour of horror movie characters. Choices are difficult and players are often forced into strange and genius decisions. The book has several modifications to the system according to the kind of game you’re playing. One modification which I really like is conversion. In Ice Station Zero, players can be infected by the ice zombies. I used red poker chips for Survival Points, but when an ice zombie hit a player, there was a chance they would be infected. An infected player would replace a red poker chip with a blue one. The blue chips were Survival Points the players couldn’t use. Once a player had more of the blue chips than the red ones, they were zombies. As the chips grew, my players started acting oddly, slower, more used to the cold. Oddly entranced by it. When the characters went full zombie, I let the players remain in control of them. The same with the werewolf game. The cheerleader and the nerd survived the werewolves, while one player failed to fight off his infection and gave in to his wolfy impulses. No one survived Ice Station Zero. It’s one of the few times a total party kill (TPK) is acceptable. As the final human player blew up the coach which had been surrounded by ice zombies, it felt like an acceptable ending to the ‘horror movie’ we’d been playing. The camera pulled away from the shot of the burning coach and the ruined ice station. They’d saved the world but it had cost them their lives. Dead of Night is a great convention game as it doesn’t last long and encourages hasty, awful decision-making. In a really deadly game like this one, there’s a risk of killing people in an unsatisfactory manner. The Survival Point currency can often get around this problem and there aren’t often instant kills without people knowing them. If you want a fun horror game which replicates the most serious and silly tropes of the genre, this is definitely one of the best light games to reflect all of that. Dead of Night can be found at Drive Thru RPG or ordered through your friendly local game store.